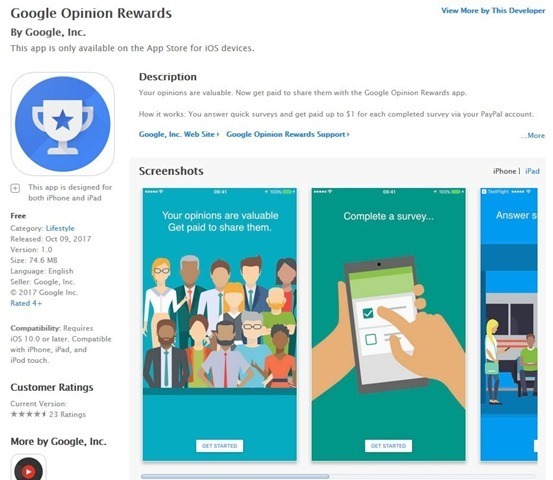 Google Opinion Rewards, the popular survey app which pays users for answering short surveys, is now available for iOS users. The app has been available for Android users for a long time, before it was introduced for iOS today. There is one big difference between the two apps. The Android version of Google Opinion Rewards pays you credits which is tied to your the Play Store. You can only use this to buy apps, games, etc which is available on the Play Store. You cannot buy devices from the Google Play Store. Why is this important? Well, because Google Opinion Rewards for iOS pays you via PayPal, which essentially means you are getting Free money which can be used anywhere. You can use your PayPal account to buy anything on third party websites. You can even withdraw it to your bank account and use it to buy anything offline or online. This may seem unfair to Android users, but it is actually logical, considering that not every iOS user may have an Android device(Google Play Account) which can be rewarded. And also, an Apple account can be literally tied to (for signing up) any email service, even your own personal website's. Even I use a non Google account for iOS. So, Google does not have any other way to reward, i.e., pay users. Download the Google Opinion Rewards iOS app from the App Store. Note: It seems it is not available in many Countries yet.